Go on put a smile on your car! 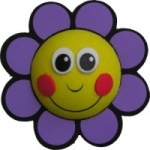 Our Purple Flower topper can be pushed onto your aerial or use the free spring provided and turn it into a Wobbler for your desk/dashboard. This Topper is approx 5cm across and is made of high density foam. Came v quickly and I'm v impressed with it. So cute!? Fast delivery.Good product. Flower helps me locate car in crowded carpark! So far i'm very happy with my aerial topper, just hope no rotter nicks it as it is rather cute. This is too nice to put on the aerial so sits on the dash where I can see it! Thank you for such a rapid delivery service.